Great system. I'll code for you later today, alright? coin.inv, what was your entry and exit again? if i have an indicator can i name it like i name a trendline???? if previous bar open signal changed from current bar open then alert. This will filter out countless signals. If it makes about 200 pips/month, I don't see how you are going to make 50% month unless you are trading 2.5 lots per $10k in capital. Okay, i figured out how you people attach these files. This is the indicator i copied and pasted above. ------- i have found what i think is the ideal setting: 3/32 i will do away with trailing stop losses, as they will trigger too much. visually checking data i see about 200 pips per major per month. Scorpion, i am wondering how long these take to program. I assume it consumes several hours. I would like to start trading live in November, assuming i get paid $1k i am owed. maybe a week or two on demo first to make sure EA works. I hope others see potential with Hull moving averages. I was going to try to turn $1k into $1.2 million in ten months with this. 2 Lots per $10k - 0.2 lots for $1k but that is risky. Even though it is great at eating trend pips. Do people think i could get a realistic 50% a month? that would be 1 Lot per $10k (4 trades simultaneous over majors). I would have to lose 1000 pips for a wipeout. 1500 2250 3375 5062.50 7593.75 11,390 17,085 25,628 38,443 57,665 86,497 129,746 194,619 291,927 437,893 656,840 985,261 17 months!! Long live the scorpion Hull EA!!!!!!!! 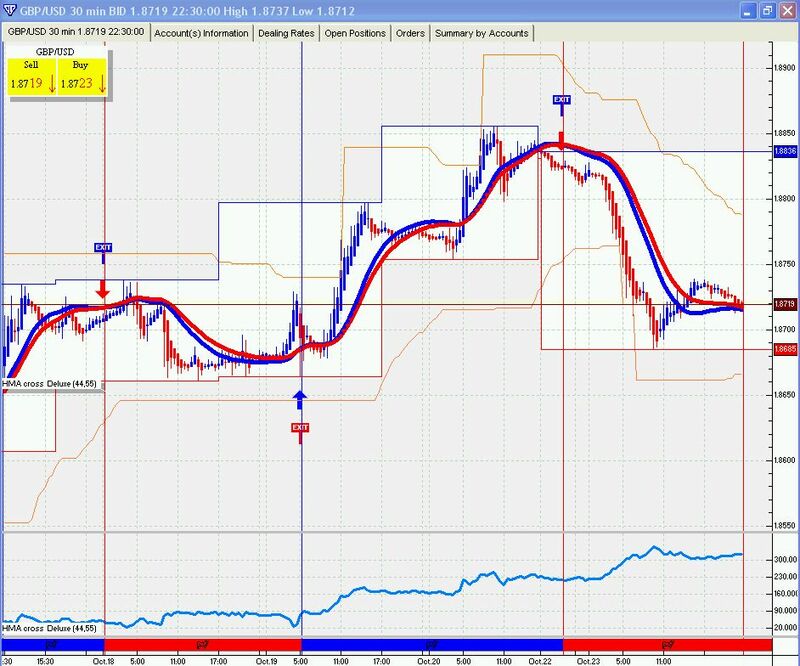 I recently made a VTrader auto trading system that has averaged over 200 pips a week this month using HMA cross on 1 hr GBP charts so its very possible. What is the exit strategy for this system? So you make 200 pips a week or a month? what were you using for stops/limits ? I like VTrader to test strategies because it is easy to code and results are accurate. Using HMA cross is a stop and reverse system that normally doesnt need stops or limits. Entries and exits are at cross of HMAs and is an always on system. From 10/18 thru 10/23 (4 days) on 30 min charts total profit was 300 pips on 3 trades using 44 and 55 periods including deducted spreads . Past performance does not guarantee future profits. see you replied above on 19th/ october but edited yesterday. i've been away from computer for 4 days.